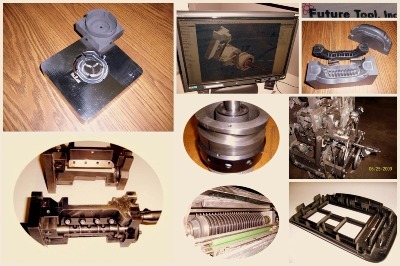 Future Tool, a precision machine shop whose dedicated work force maintains quality workmanship throughout all stages of manufacturing to ensure the customers best interests & product requirements are satisfied. Whether it's a simple washer, complex mold, machine conversion, or the reverse engineering of OEM parts, you can be confident of a quality job in an expedient manner. Achieve optimum cycle time through proper gating, venting, material selection and adequate cooling of molds while still maintaining part integrity and esthetics. Future Tool is located in Rockford, IL, 80 miles west of Chicago, IL, 90 miles southwest of Milwaukee WI., ideally located near interstates I90 and I39 and only minutes away from The Greater Chicagoland International airport at Rockford, which is home to a UPS over night air hub, allowing for last minute loading of rushed over night jobs.